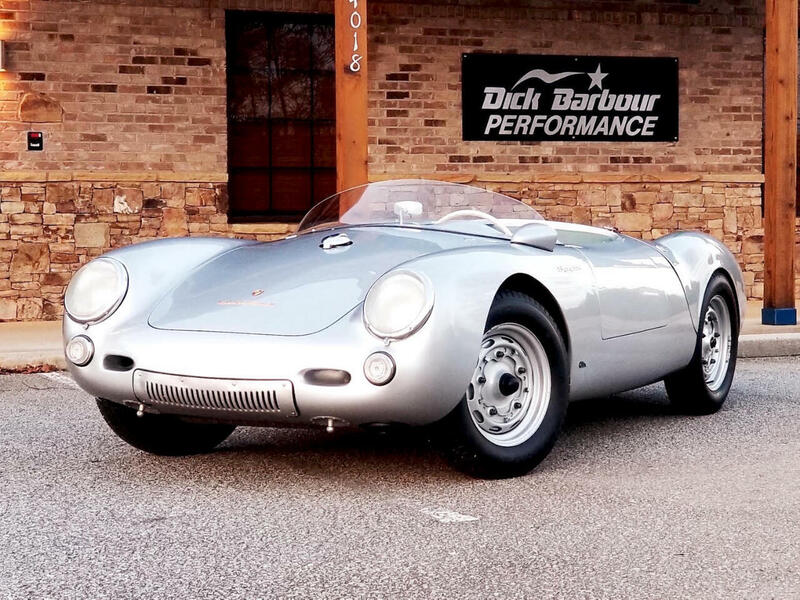 1955 Porsche 550 Spyder Tribute. This absolutely all around gorgeous 550 Spyder recreation is a built by Russ Rodriguez of Fibersteel Co, Azuza, CA. They are truly one of the best in the business! A great deal of effort was made to make sure that the details on this particular car were as correct as possible from the body fittings and badges to the gauges handbrake seats and pedal assembly. This car drives as good as it looks. It has covered 7,486 miles since its construction, ensuring that it is well-sorted and ready to go but not tired and in need of attention. This car is ready to go and will provide a rewarding driving experience rivaled only by the real thing! 2165 cc CB Performance motor. Rancho HD transaxle with freeway flyer gearing. Torsion bar / balljoint front suspension. De dion rear suspension with coil over shocks. 15 x 4.5 wide 5 wheels. Dunlop RS5 period correct tires. Updated rear clamshell to match fender contours and rear “moustache” of original 550’s installed by Fibersteel. Functional clamshell locks from Fibersteel church key is included and located behind driver’s seat. Spyder seats from Fibersteel upholstered in period vinyl. Drilled fly-off handbrake from Fibersteel. Drilled pedal assembly from Fibersteel. Correct turn and taillight lenses. Bosch horns installed in original location under from apron. Plexiglass full-width windscreen from Fibersteel. Titled as a 1968 VW 550 with a VW VIN sequence. Message: Thought you might be interested in this 1955 Porsche 550 Spyder.